Sitkowski & Malboeuf Funeral Home was founded in 1933 by the late Edward C. Sitkowski as a store front business on Lake Street and he later purchased the former Prescott estate in 1945 (originally built by the Joslin family). After a year of renovation and adjustments to the 340 School Street building he and his wife Stasia formally opened Sitkowski Funeral Home. In 1953 Edward and Stasia’s son Edward D. Sitkowski began working with them. In 1963 he became licensed, and took over the management of the business. In 1968 the Sitkowski’s accepted Roland P. Malboeuf (formerly of Paradis Funeral Home, Webster) as an apprentice. Ed and his father ran funerals together until the elder Mr. Sitkowski passed away in 1979. In 1986 Mr. Malboeuf became a licensed funeral director and embalmer and purchased a portion of the business from Mr. Sitkowski. In 1988 Mr. Malboeuf bought the entire business from Mr. Sitkowski. Mr. Sitkowski passed away in 2016. In 1984 John P. Hickey became an employee of the funeral home, and began his apprenticeship in 1986. He became a licensed funeral director and embalmer in 1988. In 1999 Mr. Hickey purchased a portion of the business from Mr. Malboeuf. Scanlon Funeral Service was founded in Oxford in 1947 by the late Thomas P. Scanlon (a second generation funeral director). He and his wife Stephanie ran the business at the Main Street location until purchasing the present location in Webster in 1952, from the Klys family. 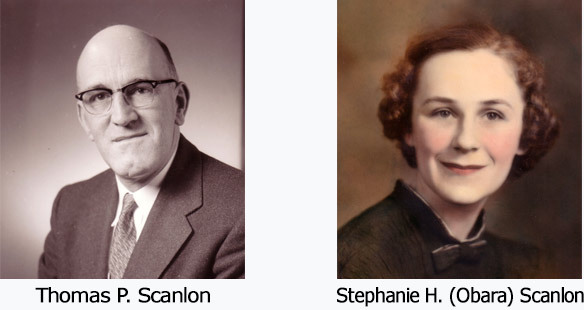 Mr. and Mrs. Scanlon’s son Thomas P. Scanlon began working at the funeral home in 1955 and became a licensed funeral director and embalmer in 1968. The elder Mr. Scanlon passed away in 1967 at which point his son Thomas P. Scanlon took over the business. In 2001 Tom sold the funeral home to Roland P. Malboeuf. Mrs. Scanlon continued to work and live at the funeral home until 2007. The management of the funeral home is under the direction of John P. Hickey. In 2017 Mr. Hickey purchased a portion of the business from Mr. Malboeuf. Mrs. Stephanie H. (Obara) Scanlon passed away in 2011.